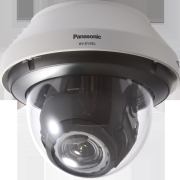 The WV-SFN311 is an Indoor Fixed Dome Network Camera that employs a newly developed 1.3 Megapixel high sensitivity MOS sensor, and can provide up to 4 H.264 High profile streams, or JPEG streams, to ensure simultaneous real time monitoring and high resolution recording from “UniPhier”; Panasonic’s proprietary System LSI platform. The WV-SFN311 can deliver up to 60 fps transmission at 1,280 x 720 image size. The featured true day/night function with the new developed multi process noise reduction and 3D-DNR allows clear images in low light conditions being able to see at 0.0 lx with the embedded smart IR LED. 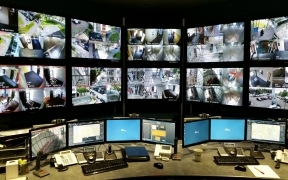 In addition, the user has a simple way to select light control modes – just choose from outdoor, indoor or fixed electronic shutter speeds. ABF (Auto Back Focus) ensures easy installation and stable focus in both colour and monochrome modes. The varifocal Auto Iris lens offers 3.6x zoom, from 2.8mm through to 10mm and with the lens distortion compensation the images can be adjusted 256 steps. SD Edge recording is available using the WV-ASM200 and a network connection. Some of the advanced features include Face detection, Variable Image Quality on Specified area to retain higher quality with lower bandwidth, Cropping function with up to 4 areas and controled by sequence, and fog and multi process noise reduction compensation.